I look back and it’s hard for me to believe that a year has already gone by since I started this blog to share my learning experience in Blender, and later to share my procedural materials in the Surface Knowledge section. I feel I’ve learned quite a big deal during this year, but that the road ahead of me is a very long one. My motivation is still there, augmented by the progress I’ve made so far, and by the fact that my portfolio keeps growing slowly but steadily. Some additions are better than others, but every single one of them is a step forward. As a means to put in practice what I’ve learned so far (physics, fluids and cloth simulation, procedural materials and lighting in Cycles) I’ve embarked myself in a little proyect, which consists in a very brief animation combining all those elements. Unfortunately, these last days I haven’t had access to my usual computer, so rendering of that animation willl have to wait till next month. 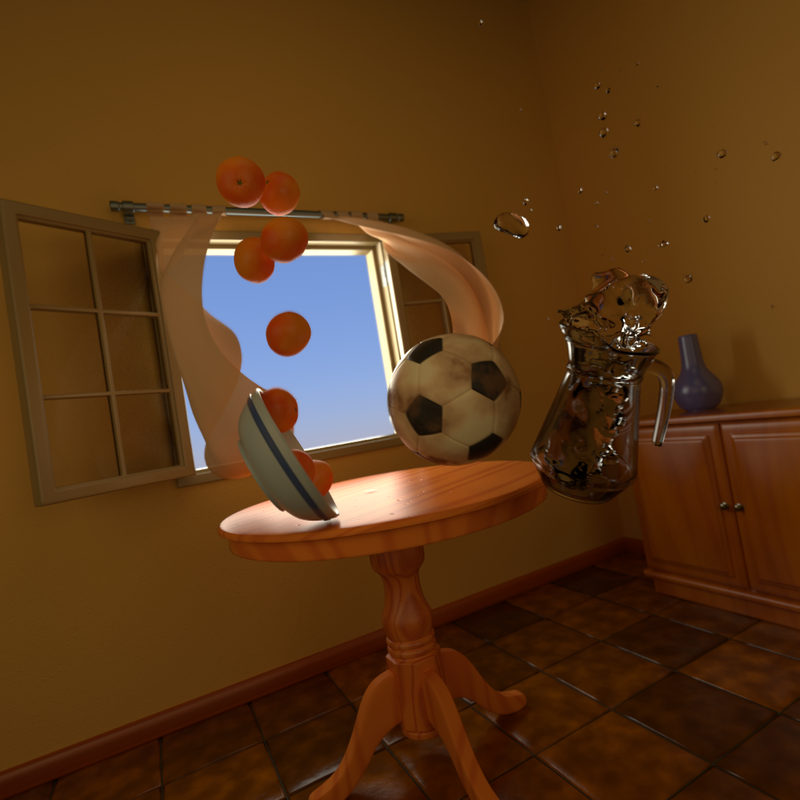 Working on an old laptop, however, I’ve managed to squeeze this little render, my last render for 2012. With it, I’d like to bid farewell to this eventful year and greet a new year of continued learning, and hopefully, even greater productivity. As you can see, I’m working on new procedural materials (stippled finish painting, ceramic tiles, football leather stained with mud, traslucent cloth material for thin curtains) as well as optimized wood material, wich will see a new, faster version very soon. See you in my next post. Happy holidays to everyone. Posted in Blender - 3D Art and tagged blender, cycles, física, fluid, fluido, lighting, materiales, materials, physics, procedural, simulación, simulation, wood. Gracias. Yo todavía pienso que podría haber añadido más detalles a esta escena, pero la verdad es que no terminaba de motivarme para seguir con ella.